If you happen to own some shares in Lufthansa, then today's a good day. As soon as news came through that the German carrier was set to seal a deal to buy up large chunks of the insolvent Air Berlin, its share price shot up to its highest level in 17 years. Why the surge of optimism? Lufthansa will now have a far greater market share, it will face less competition on domestic routes and its prices are likely to rise as a result. Yet some doubts linger. It's certainly a bad day for the majority of Air Berlin's 8,000 employees. Lufthansa will take on 3,000 of them, as well as purchase 81 planes from the bankrupt airline. But for the 5,000 other workers the future is still uncertain. What exactly will transpire with British low-cost carrier easyJet, which has been negotiating for some of Air Berlin's assets, also remains to be seen. One thing is clear though — ordinary workers will suffer because of botched boardroom decisions. For Air Berlin, this above all else has been a fall to earth from what once were great heights. The company was set up in 1978 by an American pilot looking to operate charter flights from West Berlin. At that time only planes registered in France, the US or the UK could access the relevant air routes. When the Berlin Wall came down, the way was cleared for expansion and the airline became known for operating regular flights to Mallorca in Spain. The new boss, Joachim Hunold, was hugely ambitious. A former marketing chief at LTU, a German leisure airline, Hunold wanted to greatly expand Air Berlin's route network. His goal was to knock Lufthansa off its perch. His greatest triumph was the eventual takeover of LTU — how many people end up buying the company that once fired them!? But that triumph also marked the beginning of the end. Air Berlin is a conglomerate which in many ways is a jack of all trades and a master of none. The result is that since 2008, the airline has barely recorded a profit. In 2016 alone, the airline lost 782 million euros ($927 million). Under pressure from shareholders, Hunold vacated the top job six years ago and in the meantime, five different managers have tried in vain to revive the airline's fortunes. Finally, the main shareholder Etihad — itself in difficulty— pulled the plug. 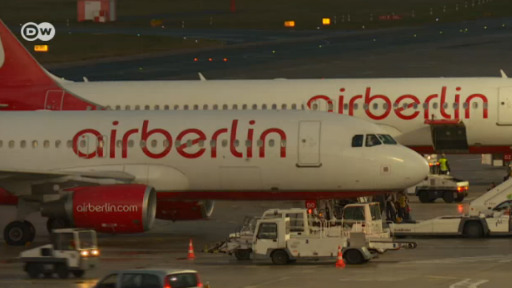 Just like that, the dream was over and on August 15, Air Berlin filed for bankruptcy. At that time it was announced that the German government had provided Air Berlin with a bridging loan of 150 million euros. That raises questions, especially when Lufthansa is playing the role of white knight at the same time as the transport minister is talking up the creation of a "national champion" that Germany needs. It's worth asking if there were secret negotiations aimed at keeping unwanted competitors such as Ryanair and easyJet out of the picture. Now that a near monopoly is to be feared on inner-German routes, worries about rising prices are flying around. But this is hardly likely to happen. On the one hand, the competition authorities in Brussels will be looking very closely at the deal, especially if easyJet leaves the negotiations empty handed. It can also be assumed that Lufthansa, which will operate most of the routes with its low-cost subsidiary Eurowings, must give up takeoff and landing slots. On the other hand, it could still be the time of Ryanair. But you also have to ask whether anyone really wants Ryanair: 19-euro flights are only possible if workers' rights are completely eroded and pilots are poorly paid. Michael O'Leary, the figurehead of this part of the industry, is finally reaping what he has sown: Thousands of canceled flights and huge gaps in the schedule. Apparently, the Irishman is feeling a real headwind for the first time in his own company. Finally there is another competitor: the German national railway operator, Deutsche Bahn. For example, those looking for a fast connection between Berlin and Munich have a real alternative. From December on the journey will take just over four hours between the two cities. For Lufthansa and its CEO, Carsten Spohr, the Air Berlin deal is just a stopover on a longer journey. And even if the airline with the crane on its tail wing is one of the biggest players in the industry, the group only has a global market share of 3 percent. So it is not surprising that Spohr has already put out feelers for the next takeover candidate — the likewise insolvent Alitalia — because what is needed is not a national champion, but a European one. Consequently the adjustment of the market will continue.